I’m sad to report that this is the first Dorie recipe that wasn’t a huge hit. Don’t get me wrong, these cookies are good. They’re just not great. I brought them into the office and they lasted three days which is usually unheard of with my coworkers. I think part of the reason they weren’t gobbled up is that they’re crispy. People seem to enjoy the chewy, soft cookies more. And, these had a lot going on–peanut butter, oatmeal, and chocolate chips! Adjust the racks to divide the oven into thirds and preheat to 350°F. Line 2 baking sheets with parchment paper, Silpat baking mats, or foil. In a large bowl, stir together the oats, flour, spices, baking soda, and salt just to blend. If the dough is at room temperature, drop rounded tablespoonsful two inches apart onto the prepared baking sheets. If the dough has been refrigerated, scoop it out by rounded teaspoonfuls and roll the balls between your palms. Place them 2″ apart on the sheets. Press the balls gently with the heal of your hand until they are about 1/2″ thick. 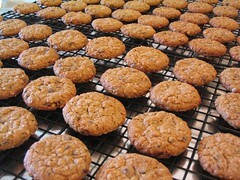 Bake for 13-15 minutes, until the cookies are golden and just firm around the edges. Lift the cookies onto wire racks with a wide metal spatula – they will firm as they cool. Repeat until all the dough has been used. Wow, these cookies should have been gobbled up on looks alone. They are just gorgeous, but soft and chewy with peanut butter is usually my preference, too. I wonder what could be done to soften them, assuming you want them golden brown still? Maybe alter the flour to oatmeal ratio so it is more equal? Thanks! I love the uniform shape and size a cookie scoop gives. My coworkers kept saying they looked like they came out of a bag from the grocery store. Hah. I would have eaten them for sure – they look scrumptious! oh yay. i didn’t love these either, although my mom did. i undercooked them slightly so they weren’t so crisp, but there’s something missing in it that would take it to the next level, tastewise. Maybe using shortening instead of butter would help soften these cookies up. I haven’t tried making them, but I’ve heard that might help. I like most cookies to be soft but for some reason I prefer crispy PB cookies. These look yummy to me!